Given the vast amount of information that is available about Titanic’s history – from her conception to her disastrous end – it is sometimes asked if there is anything new to be learned. In spite of the information available, the answer to this question is certainly a resounding “yes.” Time does not stand still. There will always be something new to learn; more myths to be exposed; and more popular misconceptions to be addressed. When Olympic entered service in 1911, her propellers were photographed and these well-known photos show her turbine-driven central propeller as a four-bladed casting. In Britannic’s case, not only is a four-bladed propeller visible in period photos, but this propeller is also visible today on the wreck. However, at present, no known photos appear to exist showing Titanic’s propellers in place and, given that the central propeller is not visible on the wreck, this raises an intriguing question. There is, however, a good reason to take a closer look at the central propellers – in particular, Titanic’s. An original engineering notebook, apparently hitherto unpublished, kept by Harland & Wolff, gives some very interesting data for Titanic’s propeller specifications (see page 124). To judge from the entries for yard numbers 400 and 401, Olympic and Titanic respectively, the records for the ships were written prior to Olympic’s 1913 refit. It seems Olympic’s entry was written in 1911 and amended in January 1912, and that Titanic’s was written no later than January 1912 and amended sometime in January or February 1912. The technical specifications are interesting enough, yet the number of blades on Titanic’s central propeller is even more so, because the figure of “3” blades is recorded very plainly. There is no alteration whatsoever: no “4” crossed out and replaced by a “3.” There is merely the figure “3.” At present, there seems to be no other primary source to contradict it – no document which gives the number of blades for this propeller. That being the case, Titanic may well have been fitted with a three-bladed central propeller. If what has been documented in this Harland & Wolff document is true, it is likely to upset the apparently universal assumption that Titanic’s central propeller was four-bladed, and render numerous illustrations and models of the ship inaccurate. This highlights the vital importance of primary sources, for so much misinformation can be spread as a matter of “common knowledge” when, in fact, it is an assumption. It remains necessary to go right back to the beginning to assess whether researchers really know what we think we know. How many differences between the two sisters have remained unnoticed, merely because it was assumed that they were identical in a certain respect? Another point is equally interesting, at least to the technical researcher. Titanic’s wing propellers are recorded as being essentially identical to Olympic’s as they were in 1911-12, with three blades and a diameter of 23 feet, 6 inches. There is, however, an important difference. When Olympic entered service, the pitch of her wing propellers was set at 33 feet. By January 1912, however, the pitch had been increased to 34 feet, 6 inches – Harland & Wolff having taken the opportunity to alter the pitch of both wing propellers during repairs in November 1911 following the Hawke collision. Similarly, Titanic’s wing propeller pitches had been assumed to be 34 feet, 6 inches,3 but this particular source has a pitch of 34 feet, 6 inches crossed out and replaced with a pitch of 35 feet.4 This seems to indicate that the proposed pitch of Titanic’s wing pro­pellers was increased sometime in January or Feb­ruary 1912, just prior to the propellers being fitted in dry-dock. As Harland & Wolff sought to find the most efficient propellers for Olympic, quite naturally they appear to have done the same for Titanic. It was in this knowledge that they estimated Titanic would be up to a quar­ter of a knot faster than her older sister. Similarly, the process worked in reverse the following year. 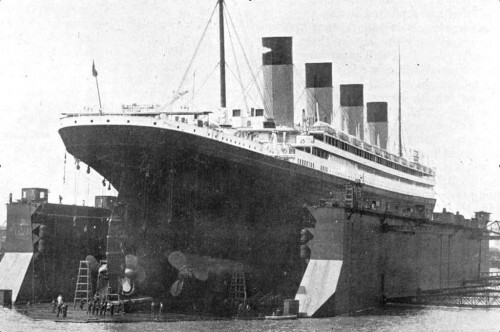 As Titanic was improved compared to Olympic when she entered service in 1912, so Olympic was im-proved when she underwent her extensive refit in 1912-13. Leaving aside the changes to the ship’s watertight subdivision and internal systems, aspects of her accommodation were improved as Titanic’s had been – in terms of the new Café Parisian, extended first-class reception room and extension of the officers’ quarters deckhouse, among other changes. Intriguingly, when Olympic returned to service for spring 1913, her original four-bladed propeller had been replaced with a three-bladed one. This was documented on page 49 in the “Andrews notebook”5 that was made available in the late 1990’s. The change does not appear to have been a success, since it had certainly been replaced by a four-bladed version by 1919, but its original installation on Olympic highlights the very real possibility that Titanic had been fitted with a three-bladed central propeller in February 1912. Why would Harland & Wolff have fitted a three-bladed central propeller to Titanic, given that Olympic retained her original four-bladed one at that time? The answer most probably lies in their attempts to find the most efficient propeller design, in order to maximise performance. No doubt, if Titanic’s performance had proved satisfactory then they would have altered Olympic when the opportunity arose. As it was, Titanic was not in service long enough to assess her performance properly, and Olympic was altered during the 1912-13 refit with a three-bladed central propeller, only for a four-bladed propeller to be fitted later on. It may have been the case that Olympic’s three-bladed central propeller paid the price for increased efficiency at the expense of increased vibration, and so the shipbuilders subsequently reverted to a four-bladed one. Britannic certainly had a four-bladed one. Her propellers were fitted after the shipbuilders had some 18 months’ experience of operating Olympic and her three-bladed one, so it certainly seems the arrangement did not live up to expectations. All this, of course, would not have been known when Titanic was being completed in February 1912, or when Olympic returned to the shipbuilder at the end of 1912. 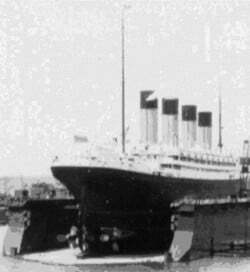 There are no known photos of Titanic’s propellers in place (as is so often the case, many photos claiming to be Titanic are actually Olympic). The photographic record is therefore of no assistance to us. As an aside, there is one interesting image of Titanic being outfitted during mid- to late January 1912.7 It appears to show a four-bladed propeller beside the Thompson dry dock, resting by itself on the floating crane platform. Why it was there at the time, or for what ship it may have been originally intended, is the subject of speculation. By contrast, it is not speculative to state that there is a primary source, apparently giving an accurate set of propeller specifications for Titanic, which identifies her central propeller as a three-bladed one. It might be the case that another document will surface in the future, contradicting this source, and recording that Titanic was indeed equipped with a four-bladed central propeller – just as historians have believed all along. However, given the fact that a three-bladed propeller has also been documented, it seems the only way to state for certain what Titanic’s central propeller was will be to hope that a method can be found to examine it in place on the wreck. Until then, or until a verifiable photo is discovered, then it will be another of Titanic’s enduring mysteries. Many thanks are due (in alphabetical order) to Scott Andrews, Bruce Beveridge, Steve Hall and Sam Halpern for all their insights; Jennifer Irwin for her considerable assistance; and the Deputy Keeper of the Records, Public Record Office of Northern Ireland, courtesy of Harland & Wolff. 2Oceanic’s propellers had a diameter of 22 feet, 3 inches when she entered service in 1899, according to a newspaper report which appeared in The New York Times on September 10, 1899. However, even if another liner had propellers of a larger diameter, Olympic and Titanic’s wing propellers were certainly among the largest in terms of their diameter, if not the largest. 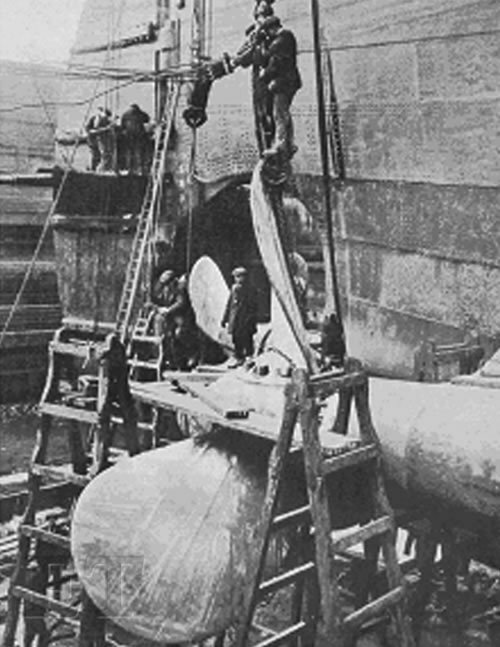 While Olympic and Titanic’s wing propellers, with a diameter of 23 feet, 6 inches in 1911-12, were considerably larger than those of most other liners, the same cannot be said of their central propellers. Lapland, Harland & Wolff’s yard number 393, had propellers with a diameter of 19 feet, 6 inches; Laurentic, yard number 394, had wing propellers with a diameter of 17 feet, 6 inches and a central turbine-driven propeller with a diameter of 10 feet. Examination of other smaller liners constructed at the time shows that the central propellers for Olympic and Titanic were by no means exceptionally large. In fact, they were about average in terms of their diameter, if compared with the propellers fitted to smaller liners at the time. 3Titanic: The Official Story. Random House; 1997. This box included a number of original documents relating to Titanic. The Guide included an appendix giving “particulars of ships built by Harland & Wolff.” Titanic’s wing propeller pitches are mistakenly given as 33 feet, while Olympic’s boiler and propeller particulars are her configuration following the 1912-13 refit. No figures are given for the number of blades. It has been assumed that Titanic’s wing propeller pitches were increased to 34 feet, 6 inches, but in fact they appear to have been altered further to 35 feet. 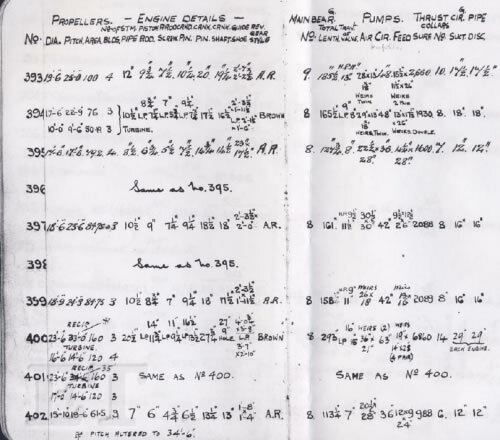 More relevant to the central propeller is the fact that this document lists exactly the same diameter and pitch measurements that are listed in the Harland & Wolff engineering notebook for Titanic. 5Although called the “Andrews notebook,” the document itself does not appear to be written in the same hand as the notes that Andrews made on Olympic’s maiden voyage in 1911, or personal letters written prior to that. Indeed, there are entries in it which post-date Andrews’ death on April 15, 1912. It is titled “Drawing Office Copy.” The name by which it is generally referred has been used so often that it is given here for ease of recognition. 7In 1911, prior to Olympic’s propellers being fitted, photos show Olympic (at her fitting-out berth and, subsequently, in the Thompson dry dock) and all three of her propellers on top of a tram. At least one other photo shows the blades of the wing propellers lying beside the Thompson dry dock. Unlike the central propeller, which was a solid casting, the wing propeller blades were fixed to the propeller boss. Harland & Wolff appears to have followed a logical procedure of moving all three propellers to the ship prior to installation, and then fitting them within a short space of time. This would appear to be the most efficient and practical method of installing them. Assuming that this was the case for Titanic as well, this raises some key questions about the photo. No tram is visible, nor the wing propeller bosses or their blades. It does not seem to be waiting to be installed. Was it even a propeller for Titanic? It is not possible to tell. Even if it was intended for Titanic, then it seems it had been removed from the ship.